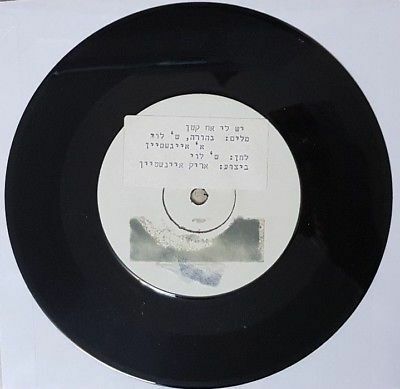 Ultra rare Israeli promo 7" by the iconic and greatest Israeli singer ever lived, Arik Einstein. The A side track "I have a little brother" from the known album children. The B side track "Fall in love with a beautiful girl"
This promo 7" was released to Radio DJ's stations only. Only handful of copies were made and it is nearly impossible to find anyone of those nowadays. This is a must have single for any Arik Einstein collector!!! Cover - Generic cover, this single was issued without a cover. Shipping: I ship well packed and protected in a double protection cardboard mailer. Record separated from the cover. You can save on combined shipping with any of my other items. Shipping for any additional LP is 4$ and 2.5$ for 7" singles.